A 26-year-old female presented with complaints of purpura and ecchymotic patches over both the upper limbs and trunk for 5 days. There was no significant past history or family history. Her menstrual history was normal. On physical examination, the patient was of moderate built and stature with no organomegaly or lymphadenopathy. Her hemoglobin level was 13.2 g/dL, total leucocyte count was 13,900/mm3, and platelet count was 10,000/mm3. Peripheral blood examination showed a mild increase in the number of leucocytes with normal morphology and distribution and markedly reduced platelets with few giant platelets. Ultrasound Sonography of abdomen showed no splenomegaly or hepatomegaly. Serological tests for malaria and dengue were negative. With no other specific symptoms except purpura and ecchymosis, a clinical diagnosis of immune thrombocytopenic purpura (ITP) was made and bone marrow aspiration was advised. 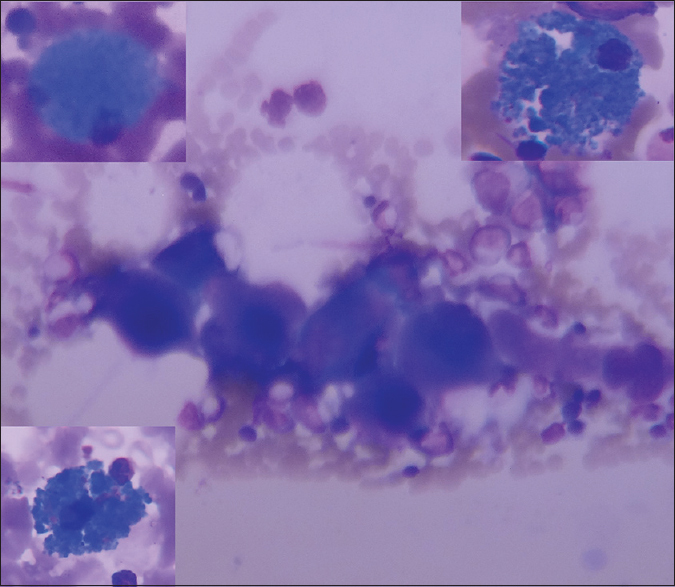 Bone marrow aspiration showed normal erythroid and myeloid series cells with a mild increase in megakaryocytes [Figure 1] with few immature forms along with few sea-blue histiocytes [insets of [Figure 1] which are large cells with center to eccentrically placed nucleus and abundant sea-blue color cytoplasm, when stained with Giemsa stain. The patient was started on steroids, and after a week her platelet count had increased to 75,000/mm3. Sea-blue histiocytes are lipid-laden macrophages which take a deep blue color when stained with Giemsa stain in bone marrow aspirates. Sea-blue histiocytes are usually seen when there is an increased turnover of bone marrow cells as seen in myelodysplastic syndrome, chronic myelogenous leukemia, idiopathic ITP, or because of some lipid storage disorder like Niemann–Pick disease or Gaucher disease. They can also be seen in idiopathic sea-blue histiocytosis,, where a patient presents with purpura, thrombocytopenia, and splenomegaly. I acknowledge the help of my laboratory technicians. Sharma P, Kar R, Dutta S, Patil HP, Saxena R. Niemann-Pick disease, type B with TRAP-positive storage cells and secondary sea blue histiocytosis. Eur J Histochem 2009;53:183-6. Ganguly S, Cunningham MT. Idiopathic thrombocytopenic purpura associated with bone marrow sea-blue histiocytosis. Am J Hematol 2004;77:405-6. Rywlin AM, Hernandez JA, Chastain DE, Pardo V. Ceroid histiocytosis of spleen and bone marrow in idiopathic thrombocytopenic purpura (ITP): A contribution to the understanding of the sea-blue histiocyte. Blood 1971;37:587-93. Varela-Duran J, Roholt PC, Ratliff NB Jr. Sea-blue histiocyte syndrome. A secondary degenerative process of macrophages? Arch Pathology Lab Med 1980;104:30-4. Quadri MI, Majumdar S, Mehra YN, Garewal G, Das KC. Sea-blue histiocytes in idiopathic thrombocytopenic purpura. The first report from the Indian subcontinent. Acta Haematol 1980;64:294-6.